You may purchase the cowl from my Etsy shop here. 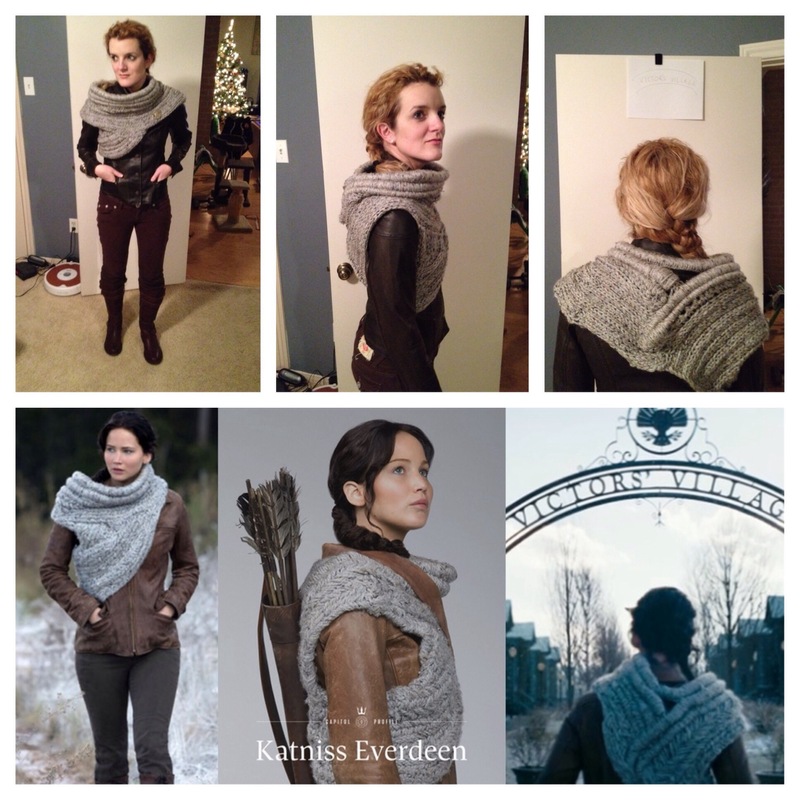 As the Catching Fire promotional material came out a few months ago, a cowl that Katniss was wearing became quite popular in the knitting community. When my mom texted me that my sister was in love with a sweater thing from the new Hunger Games movie, I knew exactly what she was talking about. I found some patterns online, but they were all missing something from the original. I decided to make up my own. The overall effect of the cowl turned out stunningly well. The cowl, in a size small, was a little smaller and tighter than the original, but very close. I’ve read that the original garment was woven rather than just knitted. The actual knitting is very simple, but the garment construction is difficult. The length/stitch count for the small is shown first outside of parenthesis. The other sizes follow inside of parenthesis, i.e. small (medium, large, extra large). The pattern gets a little long and confusing with the different sizes, so I would suggest printing the pattern and highlighting the size you are making. The neck was definitely the most tedious part of the cowl to make. 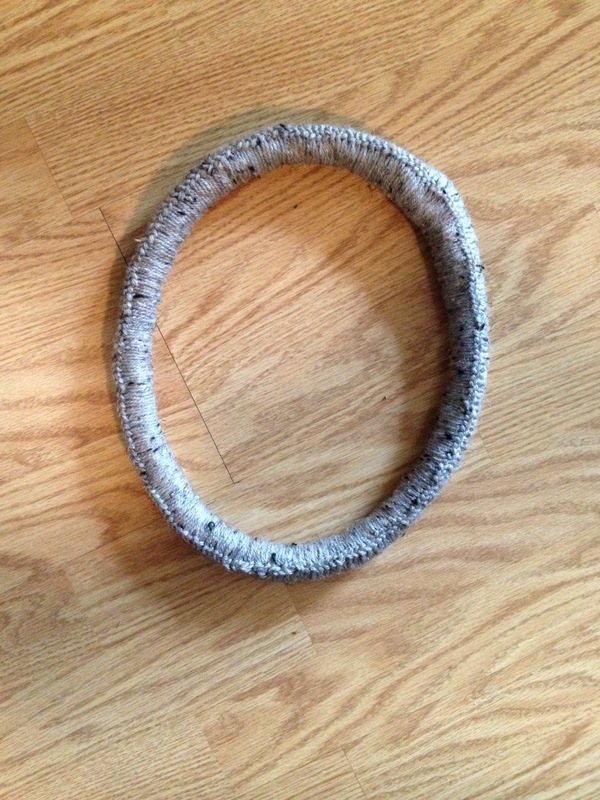 The method I used looks very much like the real cowl, but it turned out quite stiff. Modified crocheted stitches are used to cover the rope in yarn. The rest of the garment is knitted. Find a non-flammable surface outside. Form the piece of rope into a circle and align the ends so that the short piece on one is touching the short piece on the other end. The two mid-sized pieces should be touching. 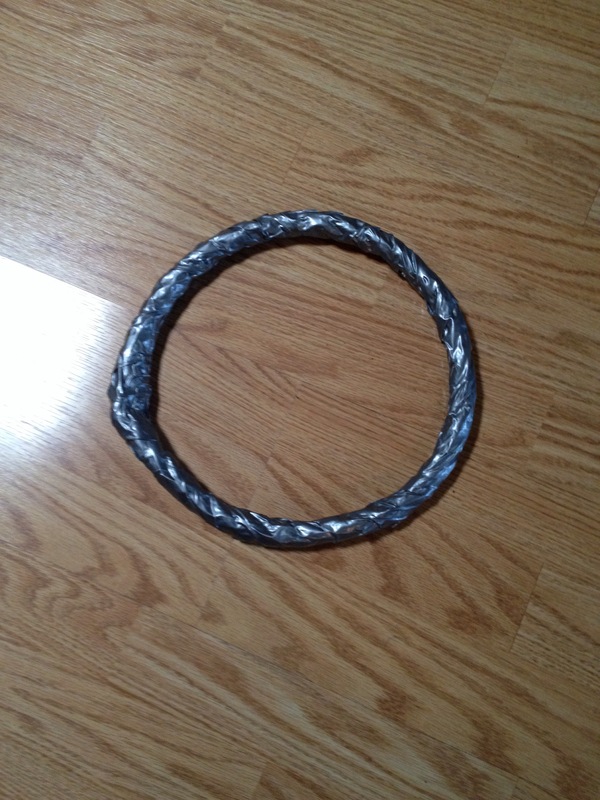 Use the lighter to melt the rope and fuse the piece into a circle. It’s OK if it’s a little lumpy. Wrap the circle in duck tape. 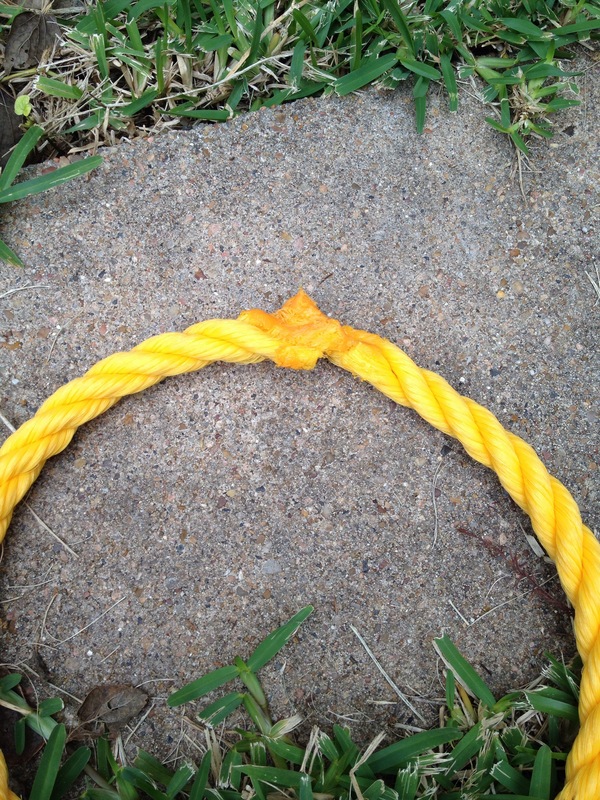 This hides whatever neon color your rope is and gives the circle some extra stability. 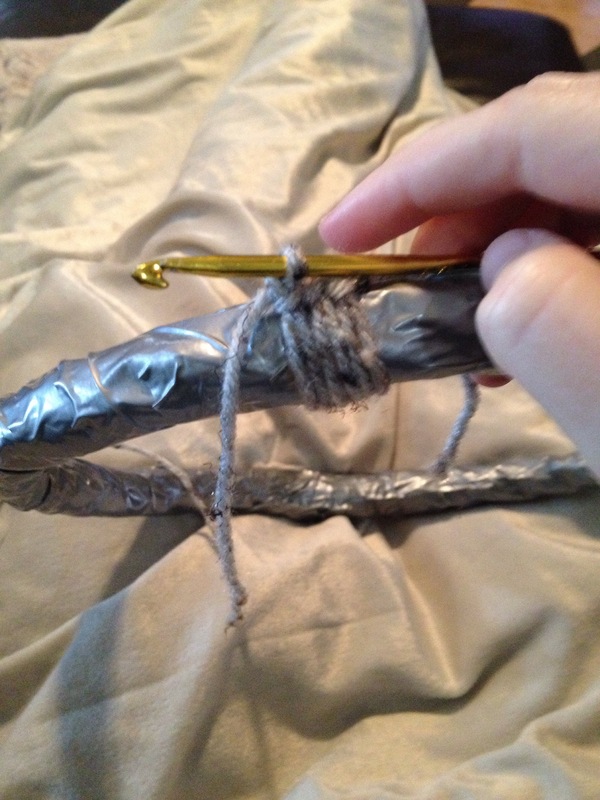 Tie a knot around your crochet hook. Wrap the yarn around the rope circle and ch. 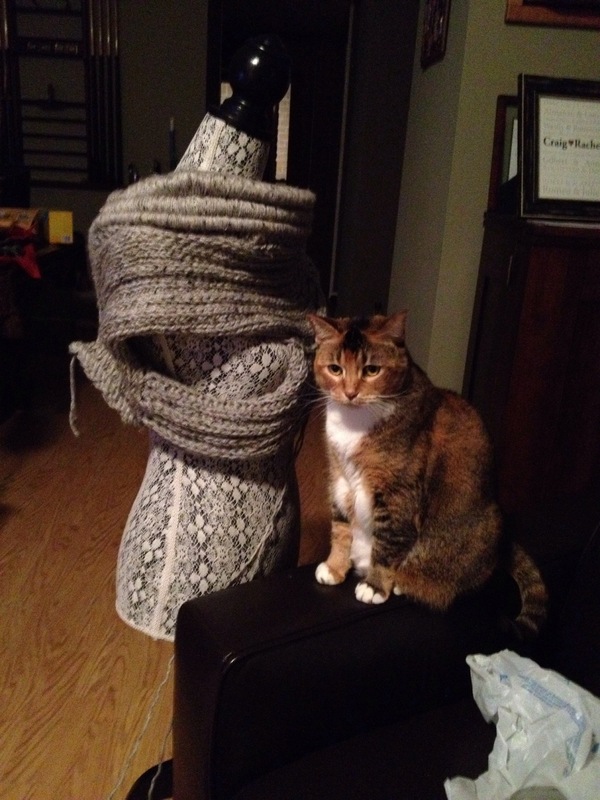 Continue wrapping and chaining until the entire circle is covered in yarn. The chain should be on the bottom of your circle. You may need to periodically push the yarn closer together to make sure no duck tape is showing. Break off and work in ends. 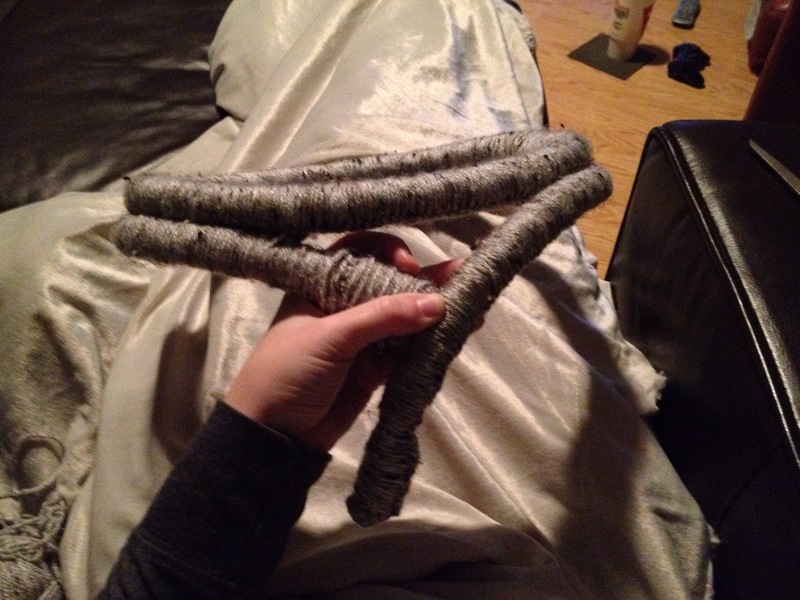 Cut 39 (40, 42, 43) in sections of both the 3/4 in and 3/8 in rope. Cover both sections in duck tape to hide the neon coloring. 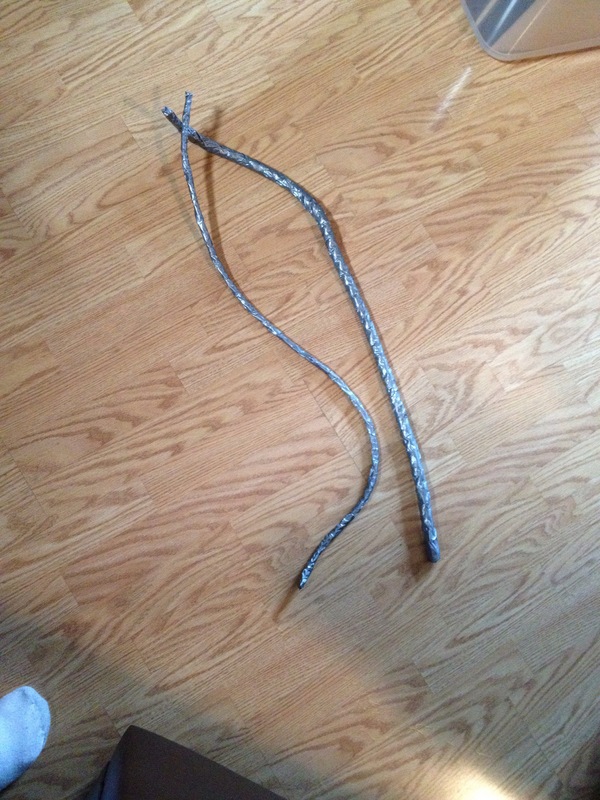 The next two ropes will not be circular, so an approximately 2 in cap needs to be made for each end of the two ropes. I already had my crochet hook in my hand, so I crocheted them. I included directions for alternative knitted caps, but they are untested. If some tries it, let me know how it works! Break off and work in ends. Cast on 12 stitches using the double pointed needles. Distribute stitches on four needles evenly. Cut yarn and pull end through all six live stitches. Pull tight and work in ends. Cast on 6 stitches using the double pointed needles. Distribute stitches on three needles evenly. Place larger caps on the ends of the 3/4 in rope. They should fit snugly. Sl st into cap about 1 in from the end of the rope on “bottom.” Wrap the yarn around the rope and cap and sl st into cap until you reach the end of the cap. Wrap the yarn around the rope and ch until 4 in of the rope is covered. Ch 5 bringing the chain along the inside of the rope, sl st into a ch on the circular piece of rope. Wrap the yarn around the rope and sl st into the next ch on the circular piece of rope. Continue until 3 in of the rope is left uncovered. You may have to wrap the yarn around the rope twice or sl st into the same ch twice to make sure that all of the rope is covered at any time during this process. Ch 5 bring the chain along the inside of the rope. Wrap the yarn around the rope and ch until you reach the cap. Wrap the yarn around the rope and sl st into the bottom of the cap. Continue until you are about 1 in from the end of the cap. Break off and work in ends. Place smaller caps on the ends of the 3/8 in rope. The should fit snugly. Hold the smaller rope directly underneath the 3/4 in non-circular rope. Starting 1 in from the end of the cap, wrap the yarn around the rope and sl st into the larger cap. Continue until you reach the end of the caps. Wrap the yarn around the rope and sl st into the ch on the non-circular rope until 4 in of rope is covered. Wrap the yarn around the rope and sl st into the yarn wrapping around larger non-circular rope until 3 in of rope is left uncovered. Wrap the yarn around the rope and sl st into the ch on the non-circular rope until you are 1 in from the end of the cap. Break off and work in ends. The hard part is done. Yay! The torso and shoulder sections are very simply knitted. If you look at the texture of the real garment, it has an effect of being knitted, but each column of stitches is a different size. As mentioned before, the garment was actually woven. Each of the neck sections is likely to come together slightly differently so adjustments may need to be made. Holding two strands of yarn together as one, cast 20 stitches on your Size US 15 knitting needles. Knit Pattern 1 until your piece measures 3 in. Continue using Pattern 2 until the piece measure about 19 (20, 21.5, 23) inches ending on R2. All measurements starting here should be measured on the edge of the fabric AWAY from the neck section. The fabric will be slightly gathered at the neck section. For the first 12 (12.5, 13.5, 14.5) inches, pick up a stitch every 1/2 in. Pick up a stitch every 1/4 in afterwards. The stitches should be picked up starting at the bottom side of the 4 in free end of the 3/8 in covered rope. 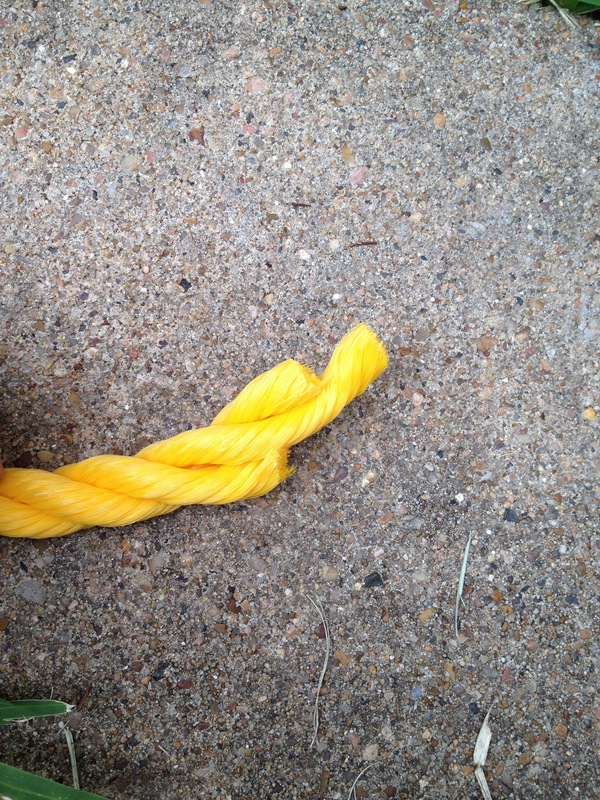 R1: K20, pick up stitch on bottom of 3/8 in covered rope. 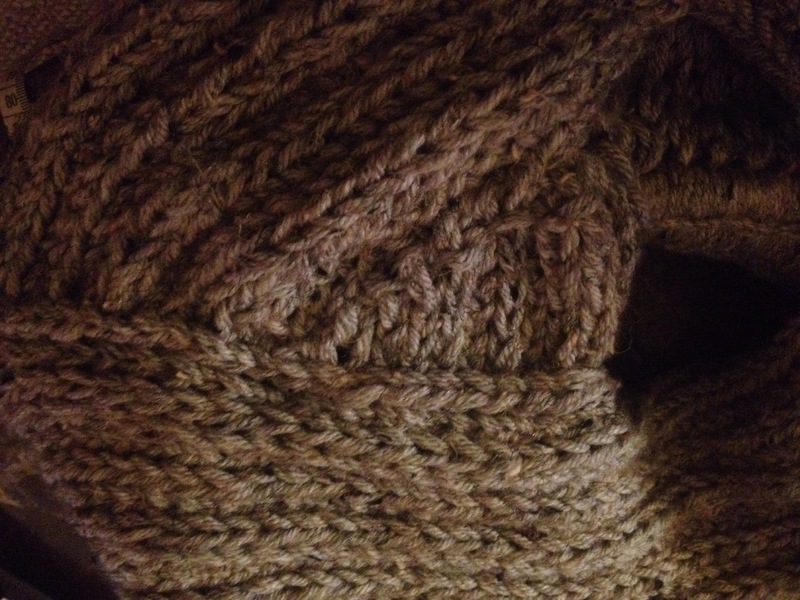 Ending on R2, leave the live stitches on one of your three needles. Right side facing, pick up 20 (22, 25, 27) stitches holding two strands together as one on the bottom approximately 6 (6.5, 7.5, 8) six inches on the right side of the section you just knitted. Following Pattern 3, knit 12 inches ending on R1. The next step is to work the stitches that are on both needles together and decrease back down from 40 (42, 45, 47) stitches to 20. Continue picking up stitches about every 1/4 in. 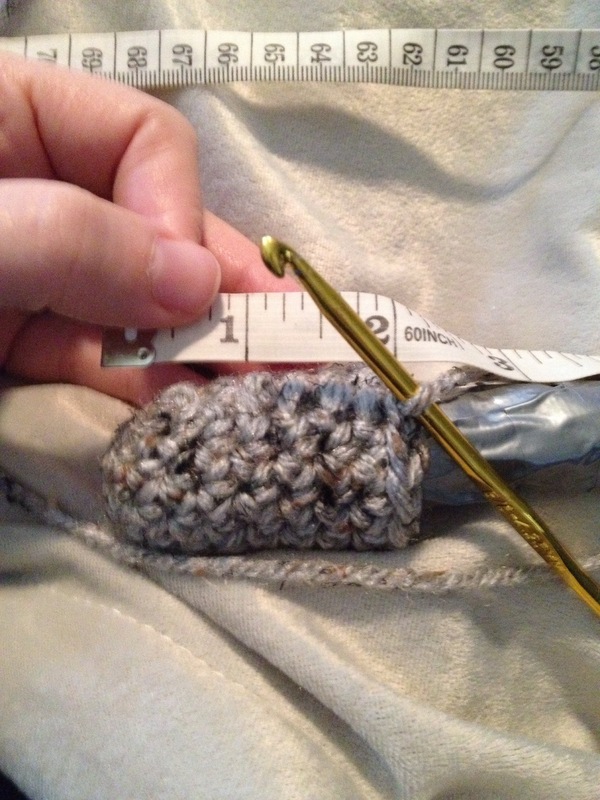 Continue using Pattern 4 for 6 (6.5, 7.25, 8) more inches ending on R1. Some additional shaping is required for the left shoulder. Knit the Shoulder Repeat Pattern three times. After repeating the Shoulder Increase Pattern three times, continue using Pattern 4 until you reach the end of the rope ending on a R2. 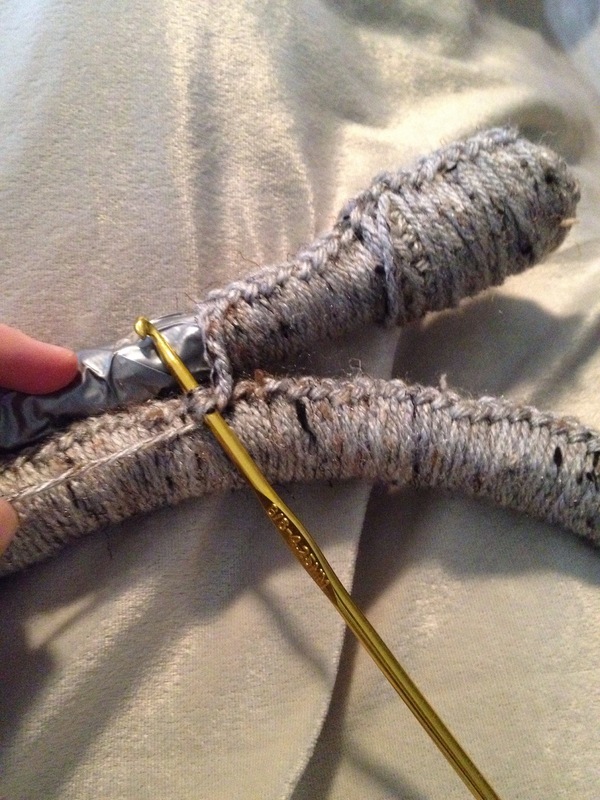 You may have to bind off differently to make everything fit together right. I bound off 12 of the stitches. I then followed Pattern 5 for three more inches and bound off the remaining stitches. Whip stitch the bound off stitches to the left side of where you started knitting along four inch free end of the rope sections as shown below. The last step is to add a triangular section near where you began decreasing from 40 (42, 45, 47) to 20 stitches. Holding two strands of yarn together as one, pick up 12 stitches pearl-wise along the bottom of the top section starting at the corner where the two sections come together. See the picture below. Follow the triangle pattern below. Bind off. Whip stitch the bottom of the triangular section to the portion below it as shown in the picture. Hello, I am in love with is cowl. How did you ever figure this out. You are incredible talented. I’ve been trying to find an example of this pattern for weeks. It looks wonderful and is exactly like the original. Could you please include a knit version of this pattern as I don’t know how to crochet. Thanks! I’m so pleased that you like it! I added a pattern for knitted caps to place on the ends on the ropes. I haven’t tested them because I don’t have any more rope. Two modified crochet stitches are still used to cover the rope for the neck, but I can’t think of another way to do it. The stitches are easy to learn, but covering the rope is very long, boring work. Let me know if you have any other questions! I’m glad you like it! All of the knitting and the two modified crochet stitches are on a beginner’s level. The knitting itself isn’t difficult. Putting all of the pieces of the garment together is the more difficult part. If you have any problems with that, I would love to help. In my opinion, covering the rope for the neck section is the most tedious, frustrating part of the project and that’s not even real knit or crochet! Hi, thanks so much for this pattern! Sorry if this is waaay after you posted this and you might have forgotten, but I’m working on it right now and I’m a little confused about the directions after Pattern 2, before Pattern 3. Is this the part that starts the section of the cowl that’s under the armpit? And if so, is it knitting from the back of this section to the front when it’s connected? I’m trying to get a picture of it in case I mess it up. When you say ‘right side facing’ do you mean the right side of the pattern or all the parts I’ve already knitted should be on my right? And when you say ‘6 inches on the right side’ do you mean I should pick up stitches starting 6 inches away from my live stitches or the picked up stitches should measure about 6 inches? Hi Becky! 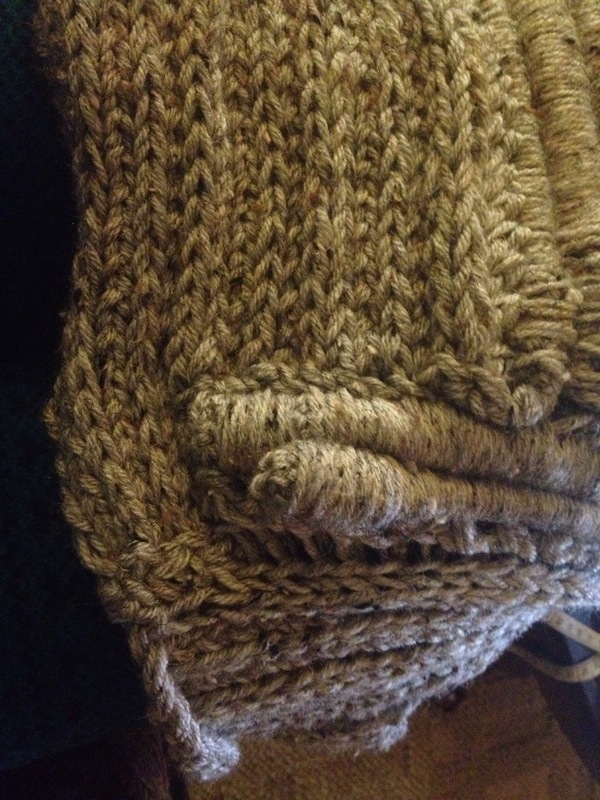 That is the section of the pattern that goes under the arm, and it is knit back to front. When I say “right side facing” I mean the right side of the fabric, which is the outside. When you pick up the stitches you should pick them up along the right (as in right vs left) side of the fabric if the outside of the fabric is facing up and the stitches you originally cast on are facing you. You will pick up these stitches next to the 20 stitches your originally cast on, not your live stitches. I hope that helps! Let me know if you have more questions. What about washing it? With duct tape in it you really couldn’t dry it in the dryer, and washing probably wouldn’t be good for it either. I would spot clean it or dry clean it. You could always substitute the rope and duct tape with something more washable. Perhaps braided yarn? It would be less stiff but have the same shape. I downloaded the pattern from Ravelry but cannot get it to print. My printer just doesn’t like it. It is a complex pattern so I definitely need to print it out before trying to knit it. Send me an email at howserrn@gmail.com, and I will send you a PDF of the pattern. That should be easier to print. Hi, I know this post was posted long ago, but I am at the part for the shoulder increase and I am not sure understand how this works. I understand that you are slipping stitches but I don’t understand how you are increasing or even why you are increasing. PLEASE I NEED HELP!! Thank you! You are creating short rows. Instead of knitting all the way across the row, you only knit part of the way. Then you turn your work and pearl and slip back. For example, the first row says to knit 17. You have 20 stitches on your needle. You simply knit 17 of them then turn your work leaving the 3 unworked stitches on your needle. Please let me know if you are still confused. I may be able to find a video or make one to explain the concept. The purpose of what I call the shoulder increase is to give some more shaping so the fabric goes up and over the left shoulder. Sorry this post is late! I wasn’t paying attention to my messages. I now understand what you meant. Thanks so much, the cowl neck came out beautifully. Sorry! I havent been paying attention to my comments. At each connection point you pull a loop underneath one of the yarn wraps from the rope sections. I don’t have a picture or video of that step. Let me know if you stil can’t figure it out, and I will try to show you something visual.